The exhibit is "an internal look into the need for validation and the creation of positive self-images" and "an introduction to the African-American experience." It includes 130 works from 33 artists depicting the African-American experience through a child's lens. Curator of Exhibitions Jason Shaiman says it's more than art for art's sake. African-American authors and illustrators have been marginalized for far too long, he says. "This is bringing a social justice component," Shaiman says. "We're trying to bring greater attention to their contributions in children's literature, but also to telling African-American stories, which are part of the American story." The books from which the artwork comes are available for visitors to read while touring the exhibit. The art represents themes ranging from African origins and slavery to the Harlem Renaissance and the Civil Rights Movement. The art in children's books is important because kids learn a lot about historical concepts from picture books, Shaiman says. African-American children grow up hearing many of the stories in the exhibit or about the people in the books, "but most kids who are not African-American only know the Dr. Kings, The Rosa Parks, the Harriet Tubmans." 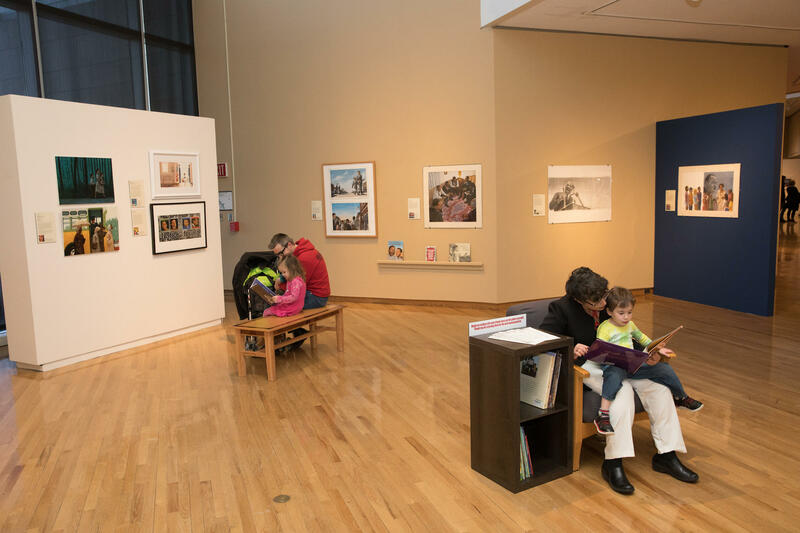 To that end, the exhibit includes each of the books from which the illustrations originate so visitors can read them if they're unfamiliar with a title. 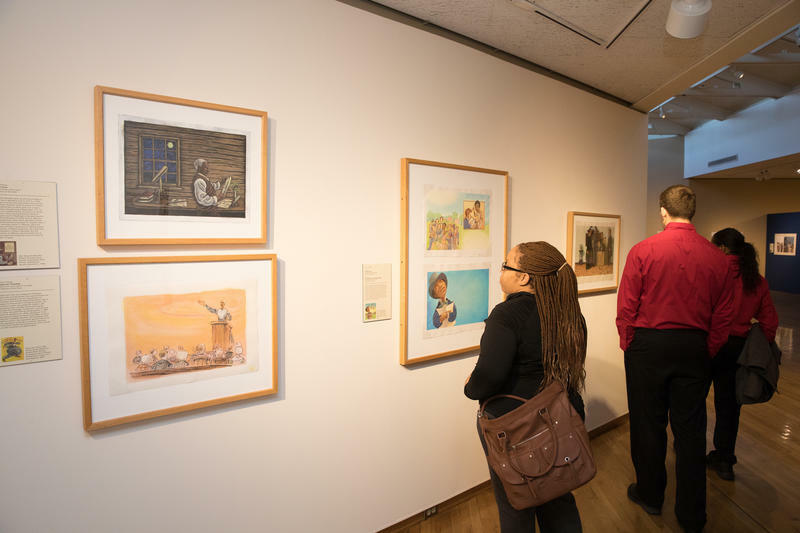 The exhibit includes pieces from the first books by African-Americans to earn the Newbery Medal and the Caldecott Award. Though those accolades date to 1922 and 1938 respectively, Shaiman points out they weren't given to books by African-Americans until the mid-1970s. Various educational events are planned during the exhibit's run. A two-day conference "devoted to dialogue" on exhibit themes and topics is set for April 20-21. Illustrators whose works are featured in the show are slated to participate. Telling a People's Story: African-American Children's Illustrated Literature is free and open to the public. It runs through June 30. 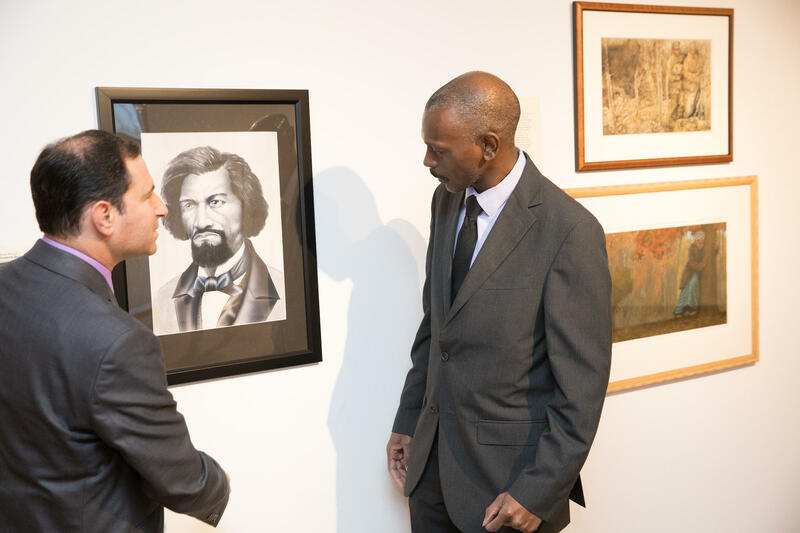 Curator Jason Shaiman, left, and illustrator Ansel Pitcairn discuss Pitcairn's painting of Frederick Douglass.